Matt Turner was born on Saturday, February 18, 1967, in Lexington, Kentucky. 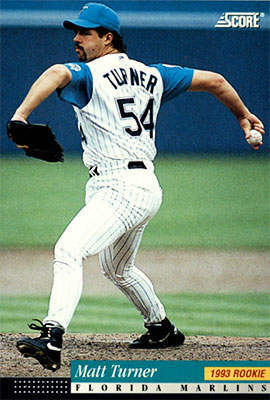 Turner was 26 years old when he broke into the big leagues on April 23, 1993, with the Florida Marlins. His biographical data, year-by-year hitting stats, fielding stats, pitching stats (where applicable), career totals, uniform numbers, salary data and miscellaneous items-of-interest are presented by Baseball Almanac on this comprehensive Matt Turner baseball stats page. William Matthew Turner was a Major League Baseball player who pitched for the Florida Marlins ( 1993 ) and Cleveland Indians ( 1994 ). Matt, his nickname, was not selected in the baseball draft after graduating high school, so he played professional baseball in the minors for six years (1986-1993), before being called up to the show. 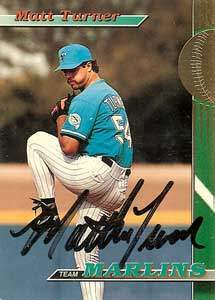 Did you know that when Matt Turner made his Major League debut, on April 23, 1993 , in Mile High Stadium, in the eight inning (relieved Joe Klink , 1 IP, 1 H, 0 R), he became the first Marlins ' player to ever wear #54 in a regular season game ?